More Dish on the B+B Bazaar: Jalapeño Beer! PB&J Ice Cream Floats! Woohoo! We can now tell you what Tørst has on tap for our merry day-to-night Bazaar on Saturday, starting with two Evil Twin releases you’ve never tasted before. One, Femme Fatale, is fermented with yuzu, and the other sounds just plain amazing: Spicy Nachos is a pale ale infused with jalapeño. Not only that, but chef Daniel Burns, formerly of Noma and the Fat Duck, will be at the Hester Street Fairgrounds in the flesh, eschewing the high-minded manners of Michelin-starred etiquette. Using a yakitori grill, he’ll be roasting chicken oysters (think of them as the chicken’s love handles) with eggplant puree on a circle of braised cabbage. Don’t call this Luksus tasting-menu item a taco, but you are encouraged to roll it up and eat with your hands. Burns will also come bearing a preview of a sandwich from the bar menu (its contents will be a surprise) that Tørst will unveil in the next few weeks (we hear lunch is also in the works). If that, and the free Brooklyn Brewery suds at 6:30 p.m., aren’t enough for ya, remember that chef Jimmy Tu from Bunker will also be close at hand, serving up orders of Cha Ca La Vong — a crispy flounder filet seasoned with turmeric and dill, and served on vermicelli with heirloom tomatoes and peanuts. 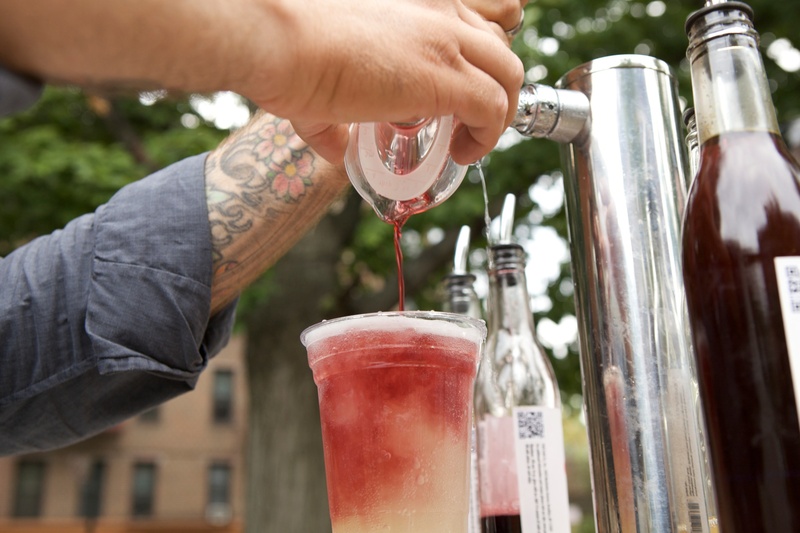 Wash that puppy down with Bunker’s artichoke kaffir lime iced tea, or grab an ice cream float. The flavor geniuses at P&H Soda Co. and Oddfellows Ice Cream are combining forces for Willy Wonka-level experiments like PB&J ice cream atop Concord grape soda. Ask nicely and they may make you an extra-virgin olive-oil ice cream with strawberry soda. All that, and we’ve got some additions to the lineup as well: the East Village’s own Ducks Eatery will be serving up its awesome bayou-Asian barbecue, and for the less hedonistic, Juisi will be pouring raw, cold-pressed juice. Of course, food is just the half of it. Check out the Facebook invite for the full rundown: those free five-panel hats, the smelliest-block-in-NYC perfume, and the taxidermy shoes are just the start of the non-grub vendors we’ve added. See you Saturday at Hester and Essex, noon to 10 p.m.